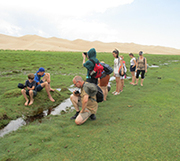 The Mongolian steppe is a destination for partnership visitors from the Bodelschwingh-Gymnasium. The desert feels like a moon landscape. 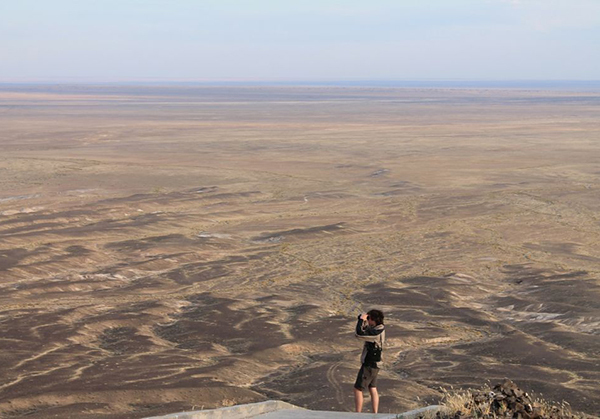 And then the Grade 12 student talks about the vastness of the Gobi Desert, about a landscape that cannot be compared with anything in Germany, about dances and music, Buddhist tradition and about people who live out hospitality. 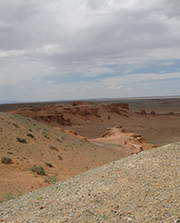 Together with her father, fellow students and their parents, and a teacher from the Bodelschwingh-Gymnasium, Merle Gerhards spent two weeks in Ulaanbaatar, the Mongolian capital. Insights like these are what the school leadership had hoped would be gained when the partnership was initiated 16 years ago. The director at the time was Jürgen Deichmann. He had studied in Japan. It was his love for Asia that in the end enabled bonds of solidarity to be established across some 6,700 kilometers. Groups from Herchen also get to know green spaces with streams and rivers. “At that time the director of the Goethe School in Ulaanbaatar was looking to establish a partnership with another school,” explains current director Dr Judith Pschibille, “and Jürgen Deichmann responded.” He founded the partnership between the two schools which has lasted for 16 years now and has been maintained through both highs and lows. It had not always been easy, because the mentality of the people there and here in Germany was so different, the director admits. Long-term planning had been nearly impossible, there were different understandings of how to organize things. “We had to learn that it wasn’t the case that the Mongolian partners did not value this friendship,” says Dr Pschibille. “They simply approach things differently.” Help in gaining this insight came from a teacher from Ulaanbaatar, who joined the teaching staff in Herchen for a period of time. And despite the occasional differences, Germans and Mongolians have a deep appreciation for the friendship. “We feel very enriched by these encounters,” says the school director. Building understanding between peoples was important for the school – in order to teach peace. Dr Judith Pschibille is certain: “When we learn to understand and value each other, then we promote peace.” And along the way one learns something about oneself through such exchanges. As well as excursions – including to the occasional Mardi Gras or Carnival event so typical for the Rhineland – and joint classes, a big feast with Mongolian specialties, dances and music, the students from Mongolia also devote time during their stay in Germany to an individual studies project. Some are related to art, some to politics or language. “Many of the students are taking German-language exams after their return,” says Pschibille. Passing the language exam opens the door for them to study at universities in Germany and Austria. Both students and school leaders agree: “This partnership is something special.” The partners in Mongolia clearly share this view – their president has awarded the school leaders the Medal of Friendship in recognition of their support for the development of the German language. 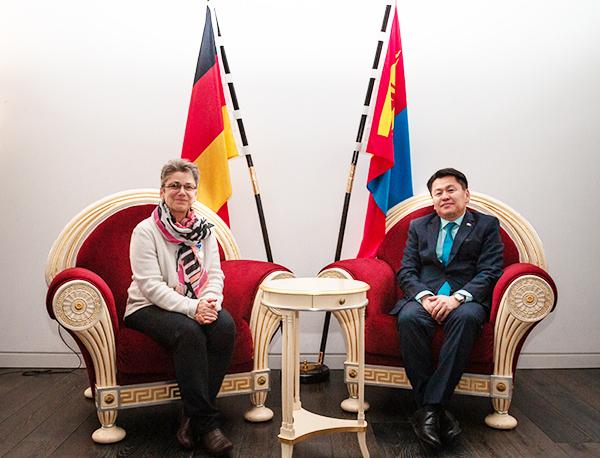 Dr Judith Pschibille and Mongolian ambassador in Berlin, Dr Damba Ganbat. The award ceremony was impressive, says Dr Judith Pschibille as she looks back on the day in Berlin. They received the Medal of Friendship, together with a red-bound certificate, from the Mongolian ambassador in Berlin, Dr Damba Ganbat. The certificate was signed by the President of Mongolia, Khaltmaagiin Battulga. Leaders of the Goethe School in Ulaanbaatar also came to the ceremony at the embassy, in addition to Pschibille and her predecessor Jürgen Deichmann.